Last year, I remember being quite disappointed at the lack of acknowledgment of the Christmas season across the city. 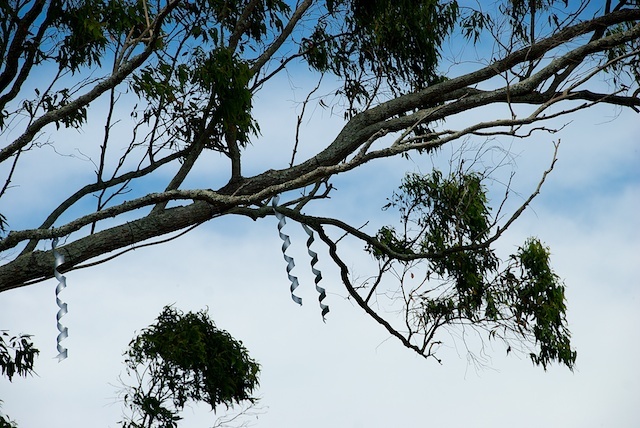 As I was wandering around Landsborough today, I couldn't help but notice the wires strung through this poor tree, and then I saw the tinsel. It is one of 29 trees that form part of a Christmas tree trail around the city. I suspect a visit to all will entail around 100 kilometres of driving, and we don't have enough nights left to post all anyway, but we shall see what the coming weeks produce!